Enjoy a very special evening held to benefit the charities of the Household Division and The Parachute Regiment, presented by St James’s Place Wealth Management. 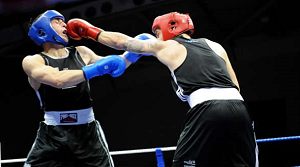 This inaugural boxing match between the Household Division and The Parachute Regiment will be a black-tie evening, hosted by Master of Ceremonies John McDonald of Sky TV. Bout sponsorship with logo credits in the programme and MC announcements is additionally available at £500. Programme advertising will also be available with details to come. 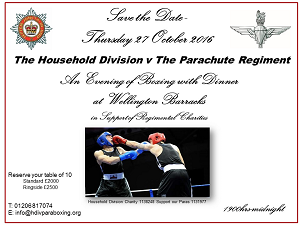 To reserve your table, please contact: info@hdivparaboxing.org or to find out more information please visit: http://www.supportourparas.org. All proceeds will go to support our soldiers and families. An opportunity has arisen within the Headquarters of The Parachute Regiment for a Regimental Charity Administrator. This will be a 3 MONTHS maternity cover post. The Parachute Regiment Megavalanche Team are heading to Alpe D’huez in the French Alps to take part in Megavalanche 2016. Show your support at: https://www.justgiving.com/fundraising/JAMES-DUNCAN15. James said “To push yourself so hard against the other competitors and the mountain itself wearing a jersey with The Parachute Regiment written on it, knowing that everyone’s watching you and cheering you on is a really special feeling”. The team are very proud to be able to help fund raise for the Support our Paras this year and wish to thank everyone that’s donated so far. As part of their fundraising efforts the team have been selling delicious cakes for the charity, raising a fantastic £292.29! If you would like to do a cake sale for us, get in touch at secretary@supportourparas.org and we can provide you with collection tins. The City Security and Resilience Network and Square Mile Salute joined forces to create the CSARN Salute. This was an evening of good food, company, entertainment and fun! The event took place on 30 June in aid of 4 charities including Support Our Paras. A big thank you to all those who helped to organise the event and everyone who attended to make the event a big success. In a world first for an amputee, Injured Veteran, Louis Smit, who served with 2 PARA from 2003 – 2013, completed a commemorative parachute jump over Normandy from a WW2 Dakota to commemorate the 1944 D-Day Landings. Louis said “Support Our Paras have been very supportive in my recovery since I was injured on patrol in Afghanistan in 2011”. “I decided to raise funds by doing a Military round parachute static line jump out of a Dakota on 6 June 2016 “. The jump was highly successful and so far Louis has raised £2,256 including GiftAid. John Mason held a black tie Trinity Ball in support of 3 charities: SUPPORT OUR PARAS, Hire a Hero and Churchill Lines Charitable Fund. The evening began with champagne reception and dinner and ended with dancing to a live band. A silent auction and live auction took place with some superb and unique items. A big thank you to John and his wife for their organisation and hospitality and to all those who attended and donated. Andrew and Paul continue taking on amazing challenges to raise money for 3 charities including Support Our Paras. Serving Paratrooper Andy has even thrown in a few individual challenges of his own, including tabbing up the highest peak in the Pentlands with a 20kg bergen, boots and a log designed to be carried by 6 men. Enjoy a very special evening held to benefit the charities of the Household Division and The Parachute Regiment, presented by St James’s Place Wealth Management. This inaugural boxing match between the Household Division and The Parachute Regiment will be a black-tie evening hosted by Master of Ceremonies John McDonald of Sky TV. Individual places are available on standard tables for £200. All proceeds will go to support our soldiers and families. If you want to experience the opportunity of a lifetime by taking part in a tandem sky dive with the best in the business, make sure you visit: http://supportourparas.org/red-devils-tandem-sky-dives/ to find out how you can jump for us! Do you want to raise money and awareness for the charity? Do you want to try doing something new and different? Need a little bit of inspiration? Visit: http://supportourparas.org/raise-money-by-doing-something-different/ for an A-Z of some great ideas. We really like K – Kids… Getting the younger generations involved and L – Local… Fundraising that relates to the local area. 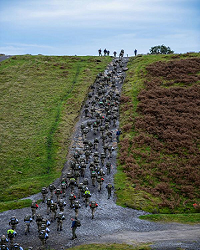 The original PARAS’10 race, now firmly established as one of the UK’s “must do” endurance challenges. Located at Catterick Garrison in North Yorkshire. There is also a 2km fun run for children between 8 and 14 years old known as PARAS’2. There are trophies for boys and girls in the following categories: 8/10, 11/12 and 13/14. 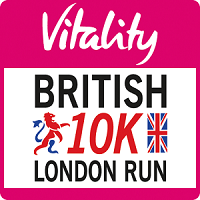 The Vitality British 10K London Run is staged on the world’s greatest road race route through the heart of Central London, passing many of the capital’s truly world class historic landmarks. This is the last chance to register! Entries close on Friday 1 July. Contact: secretary@supportourparas.org or 01206 817074 for more information or to sign up. Costs and Sponsorship: We ask for anyone wishing to join up to pay a £35 deposit which covers the cost of the place and raise £200 in sponsorship money towards the charity. In the event of completing the race and raising £200 your £35 cheque will be destroyed (we have to pay for these places, so your deposit protects us if you don’t show up! We have been shortlisted in the nominations for Local Charity of the Year 2016/17. between 13 – 26 June 2016 or instore. 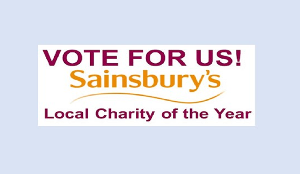 Since 2009 Sainsbury’s stores have each selected a Local Charity of the Year to partner with and with the support of their customers they have now raised over £11 million. It makes a big difference to local charities at the heart of the communities. The winning charity will receive a year of support from the store, which will include fundraising for and awareness of your charity. In return we ask that you would be able to come in store every so often to maintain a charity presence so that customers are able to see where their money is going. 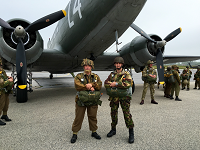 Injured Parachute Regiment Veteran, Louis Smit, will be completing a static line parachute jump over Normandy on the 6 June from a WW2 Dakota to commemorate the Normandy Landings during the Second World War. This is a world first for an amputee. Louis was injured and medically discharged in 2013 following a Taliban attack whilst on patrol in Helmand Province, Afghanistan which resulted in him losing his right leg below the knee. Louis is raising money for Support Our Paras and says “Support Our Paras have supported me through some tough times during and post injury from adaptations for driving my car to educational courses so I could retrain as an electrician to enable me to gain meaningful employment. Your donations will go a long way in support of injured Paras”.